Washington climbers go where and when it’s cold enough, for a sport that offers relatively easy advancement for newcomers. 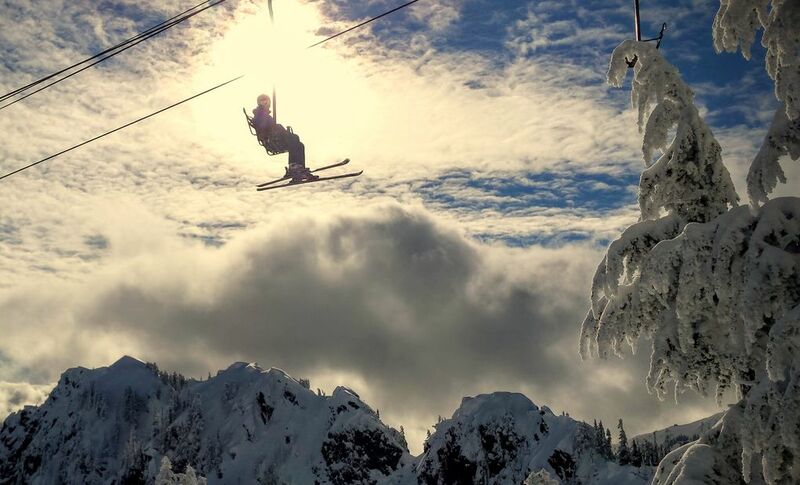 Kim Desrosiers couldn’t pinpoint exactly why she was so drawn to ice climbing, but as she unpacked her gear in the Cascades last summer, she knew she was exactly where she was meant to be. Desrosiers, who lives in Valley Forge, Pennsylvania, began rock-climbing a few years ago and was inspired to take the American Alpine Institute’s (AAI) introductory course after getting a taste of ice climbing in New Hampshire. She chose the Bellingham-based institute because it’s regarded as one of the top climbing schools in the world. Jason Martin, operations director for AAI and co-author of “Washington Ice: A Climbing Guide,” says it’s easier to move up the ladder of challenge in ice climbing than in traditional rock climbing. “Anybody can do it, it’s just a matter of what level they can do it at. At the very least they have to walk to the climb — if they can do that and have a base level of fitness, they can climb something,” he says. A seasoned mountaineer, Martin was won over by ice climbing as a sport after learning the techniques to make challenging ascents of Mount Rainier and Mount Baker. This is hard to believe as you watch people “spiderman-ing” over the beautiful but unforgiving stalactites of a frozen waterfall. But Martin explains it’s all in “managing your pump” — referring to anaerobic muscle fatigue in the forearms and calves. (Harder climbs are referred to as “pretty pumpy.”) A skilled ice climber is good at both minimizing risk by placing equipment safely, and finding positions where he or she can rest to “let the pump go down,” so as to continue climbing. For vertical climbs, ice climbers progress on a rope behind a lead climber, who sets ice screws into the frozen wall. Carrying an ice tool (a reverse curve pick ax) in each hand, and wearing crampons, climbers methodically kick the toe points of each of their crampons into the ice in turn, and swing their ice tools into the ice, one hand after the other, to transport themselves via these four points of contact. The typical progression is to start at lower angles and work up to higher and higher angles — from walking on ice with crampons, to using one ice tool, then moving to vertical climbs that require two ice tools. According to Martin, it’s not uncommon for beginners to climb even medium-ranked ice, especially if they have some rock-climbing experience. One of the biggest challenges for ice climbers in Washington is the state’s maritime climate. Much as the surfer anticipates conditions that will create the perfect swell, the ice climber waits impatiently for prolonged cold snaps — and then moves quickly to exploit Washington’s capricious conditions. 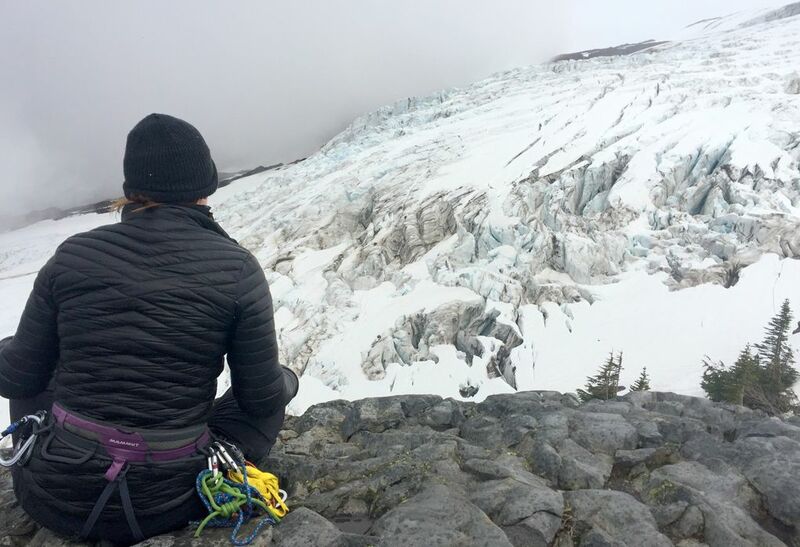 This is why the AAI holds its beginner’s course on the predictably frozen glacial flanks of Mount Baker, where Desrosiers found her climbing muse last July. “With climbing and especially ice climbing, mindfulness and awareness are a big part of it,” says Desrosiers, a longtime meditator in the Tibetan Buddhist tradition. Ice climbing requires special training and equipment, and it is not safe to attempt it without them. 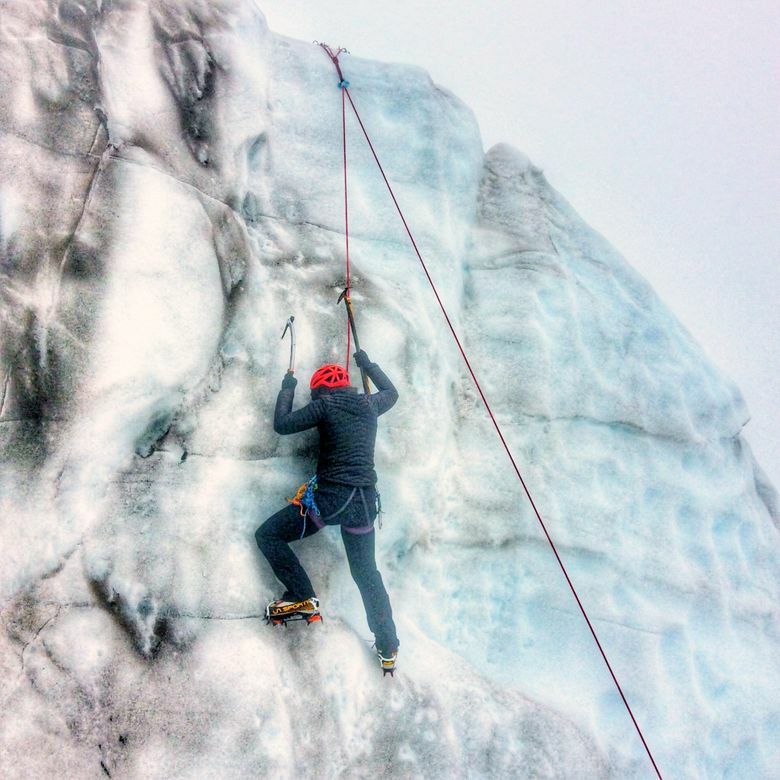 To get you started, the Bellingham-based American Alpine Institute offers ice-climbing courses and guided climbs for individuals and groups of all skill levels. Programs include both alpine ice and waterfall ice in Washington, British Columbia, California and Colorado. 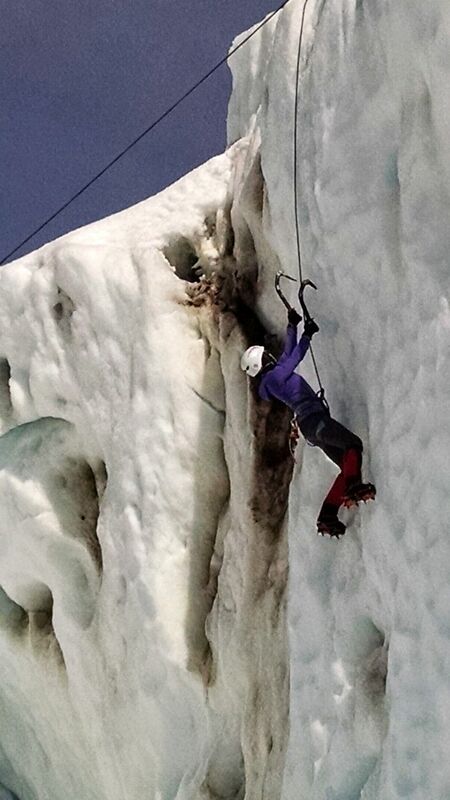 The introductory ice-climbing course offers sessions May through September at Mount Baker. The institute also offers daylong guided climbs for those who can’t wait until next spring to try it. 360-671-1505 or alpineinstitute.com. • Pan Dome Falls, viewed from Chairlift 2 at Mount Baker Ski Area. • Indian Creek Falls at Indian Canyon Park in Spokane. • Banks Lake, including several viewing spots right off Highway 155, in Northeast Washington near Electric City. Kathryn True is a Vashon Island-based freelance writer.